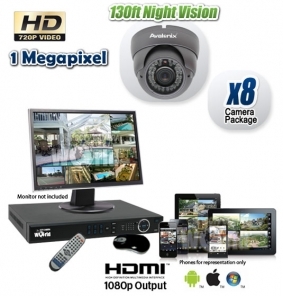 This HD CVI CCTV Camera System includes Eight Outdoor Vandal Proof Dome Cameras with Varifocal Lens that provide true 720p video resolution thanks to their 1 megapixel image sensor. These cameras paired with the included 8 Channel HDCVI DVR record 720p high definition video equivalent to that of a DVD. Equipped with 48 high intensity infrared LEDs that provide night vision, these cameras have the ability to see 130ft in darkness. The lens on these cameras is a special 2.8-12mm varifocal lens that lets the user adjust the field of view by hand at the camera. You can choose to adjust the angle of view from 90&deg; to 20&deg; making them perfect for placement anywhere indoors or outdoors. Our dealers love this weather proof and varifocal camera design because it gives the flexibility of using the camera everywhere, near or far, indoors or outdoors. 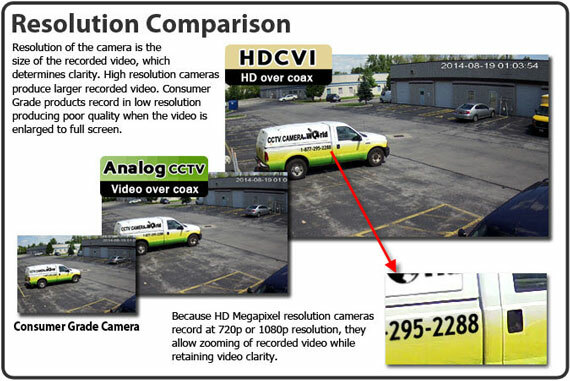 The 8 Channel HDCVI DVR included with this HDCVI system has too many features to list on one page, so we have summarized all the popular ones. The DVR recorder is a high definition one of course to record the 720P video coming from the cameras. It has multiple recording settings, including motion detection, continuous 24/7 recording, and calendar day & time based recording. You can even combine multiple recording and set each method for the cameras individually. It also features auto video recycling, so when the DVR's hard drive is full, it will overwrite the oldest video first. You can even set that setting off and do it manually.